Judging by the emails I receive it seems that it has been difficult to access accurate information about Smarties and their history. After some searching I have drawn together several documents that I hope will paint a clearer picture. I have also found some items that, in my opinion, help to explain several of the recent policy decisions made by Nestle in relation to one of our favourite confectionary brands: Smarties. Smarties are brightly coloured, sugar coated sweets with a milk chocolate centre. The mix comprises eight colours - red, yellow, orange, green, mauve, pink, brown and blue(i).The orange sweet has orange flavouring in the chocolate centre. Nestlé Rowntree has produced 5,000 million Smarties caps(ii) over the last 25 years. When production of Smarties resumed after the Second World War, Smarties were made with plain chocolate because of the shortage of milk. If the Smarties eaten in one year were laid end to end it would equal almost 102,000 km and if they were put in tubes and these put end to end it would equal almost 29,000 km. (i) The blue Smarties were discontinued in June 2006 and were replaced by white ones. (ii) The Smarties tube caps/lids were discontinued when the Hexatube was introduced in 2005. 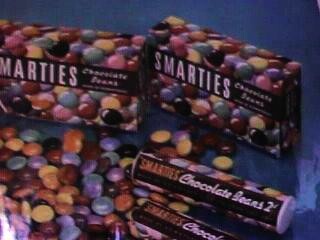 Smarties were launched as Chocolate Beans in 1937. Initially priced at 2d, they were renamed Smarties and packed in the famous tube one year later. 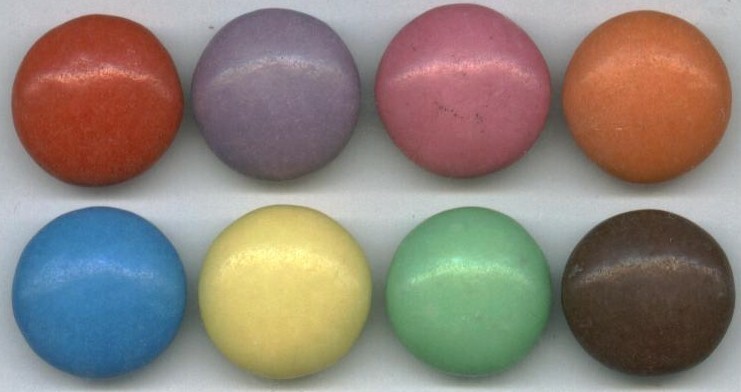 The eight original colours - red, yellow, orange, green, mauve, pink, light brown and brown - remained the same until the replacement of the light brown by a blue Smarties following a successful promotion in 1989. Before 1958, the dark brown Smarties had a plain chocolate centre the light brown one tasted of coffee. Original 1930's tubes and boxes. Image supplied by a friend. About 570,000 tubes of Smarties are made at Nestlé’s York factory every day and exported to the Middle East, Far East and South America. Here is the back of a tube that a friend of mine brought back from Saudi Arabia for me in 1995.
b) Are topics that I will cover later on. If you want to see the complete source of the information, simply click the link below. Smarties is also one of the biggest selling boxed Easter Eggs and has special Christmas presentations in Giant Tubes, Novelties, Christmas cartons and in all Christmas selection boxes. The original colours were dark brown, green, light brown, orange, pink, violet and yellow. Prior to 1958, the dark brown sweet had a plain chocolate centre, the light brown sweet had a coffee flavoured centre and the orange sweet had an orange flavoured centre. As a result of consumer research, this was then changed and milk chocolate was used for all the centres with only the orange sweet remaining flavoured. The blue Smartie had been in European Smartie packs for some years before it was introduced in the UK for a limited period in 1988 to celebrate Smarties' 50th birthday. The promotion was so successful that the blue Smartie was then introduced permanently, replacing the light brown coloured sweet. June 2004 saw the launch of Fruity Smarties - containing real fruit juice. Chewy Fruity Smarties have a twist - the colour on the outside does not match the flavour on the inside!